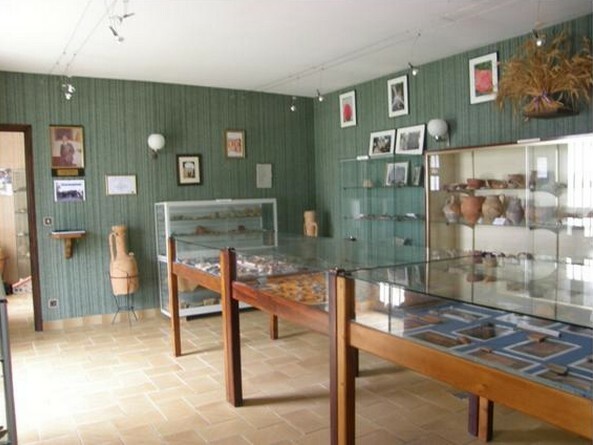 The museum was founded about fifty years ago, after the discovery in July 1967 of a Visigothic graveyard at Mourel Morts near the village of Villarzel-Cabardès (on the D620 a little to the north of Trèbes, east of Carcassonne.) 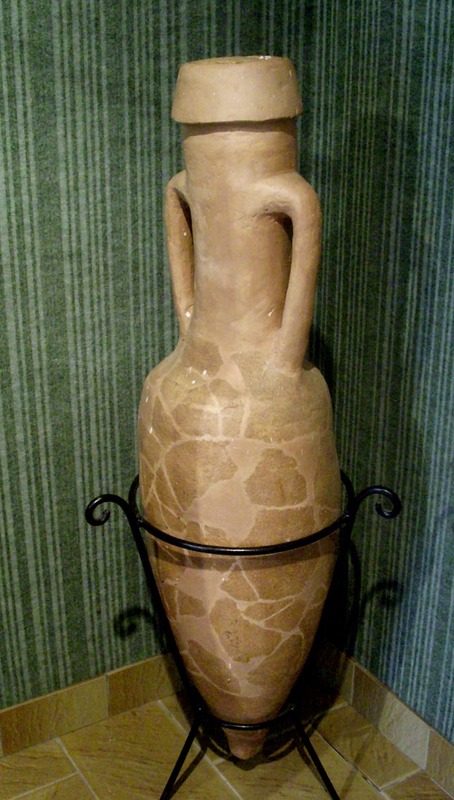 In September 1967 the "Société Archéologique de Villarzel-Cabardès" was founded. The following year this society became a member of the prestigeous Société d'Etudes Scientifques de l'Aude, under the patronage of M. Claude Journet (after whom the museum is named) and M. Guy Rancoule. I know "SESA" and some of its members, having been a member since 2002. It is well-known in the Aude department and has many interesting archives you can study at their headquarters in Carcassonne. 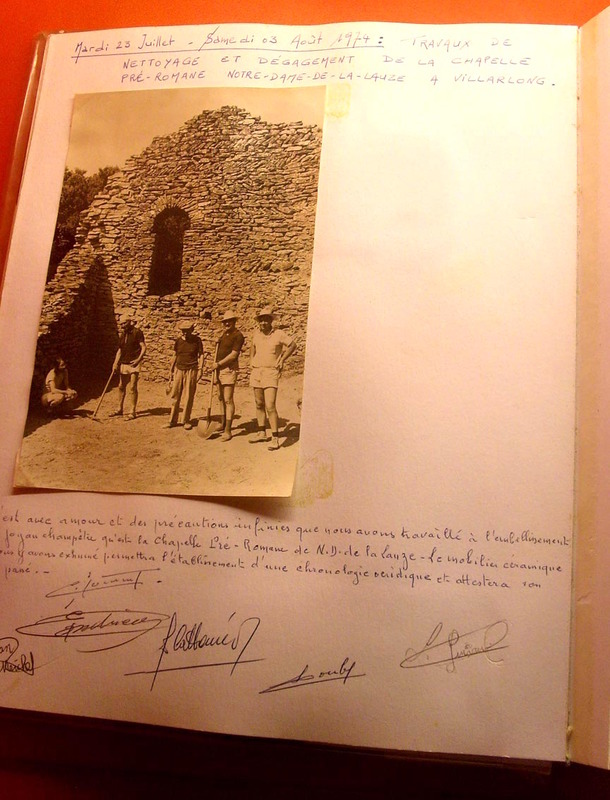 Thus, in 1969 the members of the Villarzels society could begin their excavations, with all the finds being under the protection of the Mairie and stored in the village church! 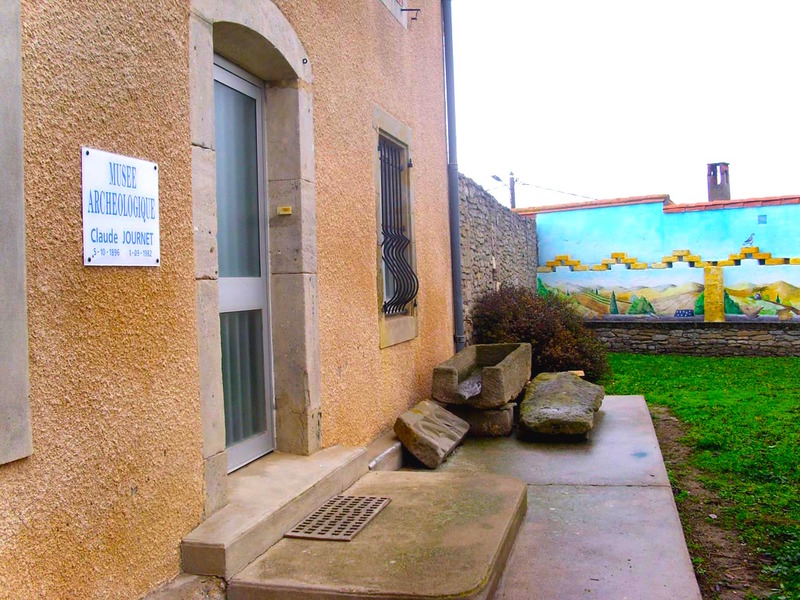 Eventually in 2000 they were able to buy the house behind the village's Mairie and the museum was founded. (It is well-sign-posted in the village and easy to find.) It has a pleasant walled garden with murals. My visit with friends had been organised for a while but on the day it rained! 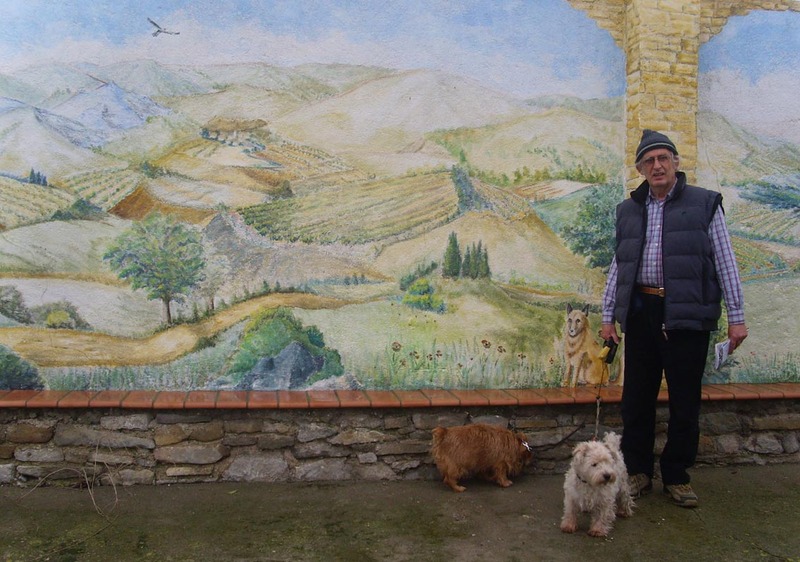 Never mind, we enjoyed the murals in the garden just the same, even if Malcolm's dogs were not in the least interested is a Visigothic dog and the Visigothic maiden was dressed in medieval costume, not Visigothic costume! 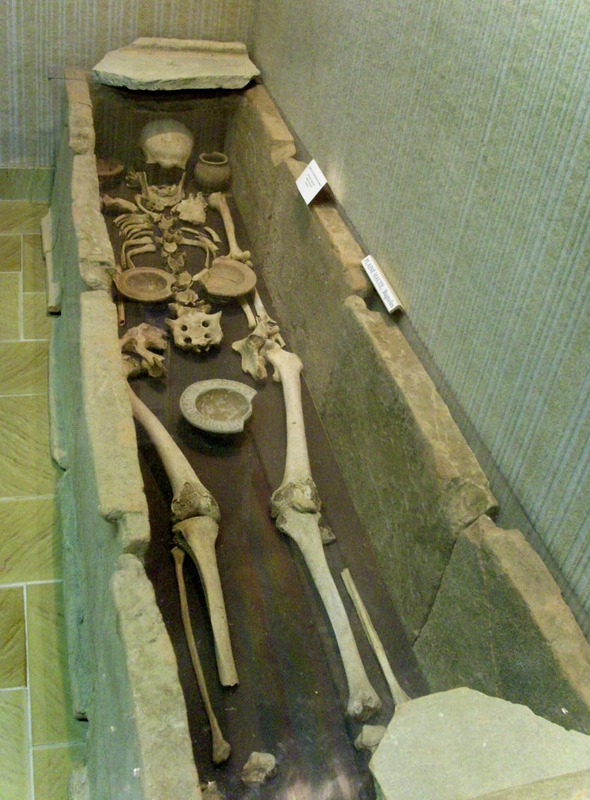 Right near the door of the museum is the Visigothic stone coffin where once was buried a young woman, maybe she was a princess, for inside the museum you can see a cabinet holding the things found in the graveyard which, as well as skulls shown in the first picture, holds the jewellery of the princess. Then - a tomb with the body still in it! I apologise for the poor quality of the photos - it's caused by the flourescent lighting. I had never before seen a tomb made of tegulae before. 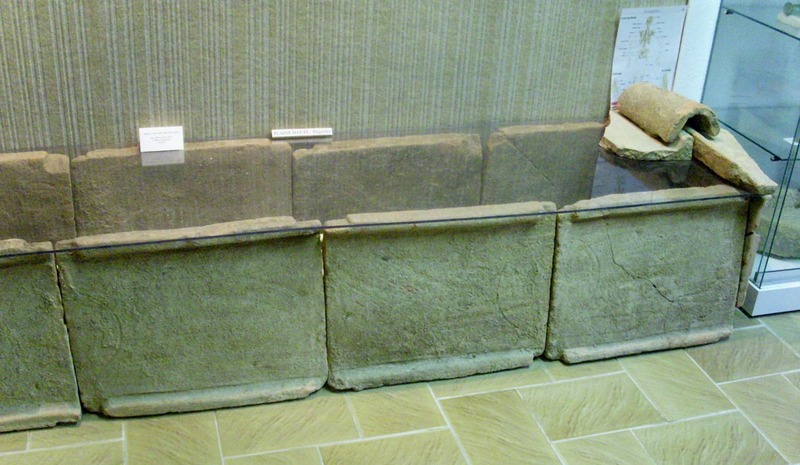 These are the incredibly large roof-tiles that the Romans used. Monsieur Louis Guiraud was our guide and explained everything very clearly to us. 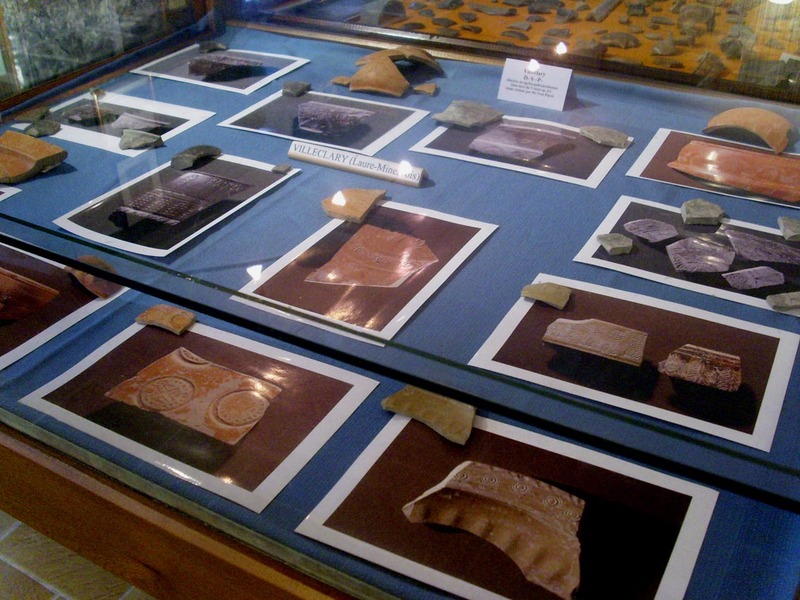 The museum holds remains from the Celts, the Romans and the Visigoths, as well as some medieval items. All was wonderfully organised and there was much to see, plus maps and directions to other places nearby of interest. A presentation idea I particularly liked was a cabinet of large photos to clearly show the tiniest design detail found on the pottery shards. 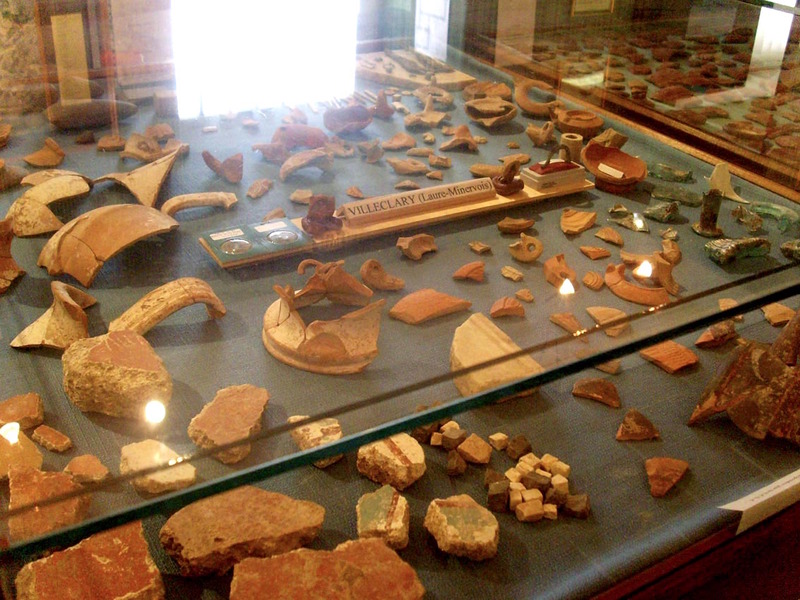 The museum concierege, Monsieur Louis Guiraud, my friend Malcolm, and the inevitable amphore. 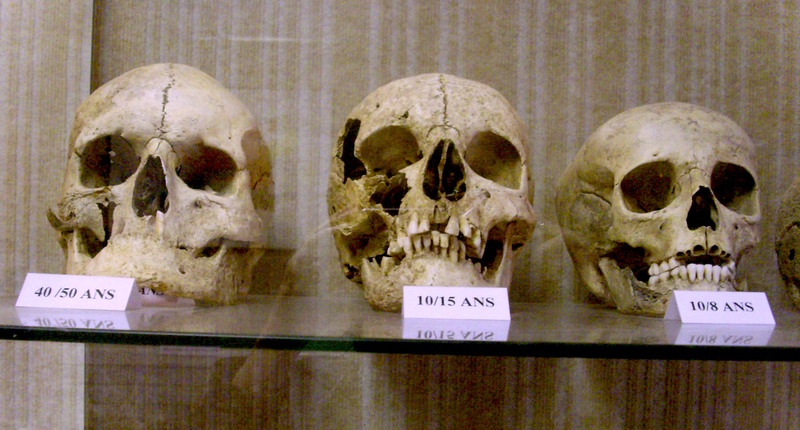 These had pointed ends so they could be stood upright in a bed of sand in the holds of ships. Villarzel-Cabardès is 10 km north of Trèbes, itself 7km east of Carcassonne. The museum opens sur command - phone M. Louis Guiraud on 04 68 77 02 11 to make a rendezvous. Entrance is free, but there is a box for contributions towards the upkeep. I have still to see the Visigothic graves; due to the bad weather we could not make the walk to see the graves, but you can find more information by clicking here. Also nearby, Louis Guiraud told us, is the chapel of La Lauze with its cemetary beside it. The official photograph. 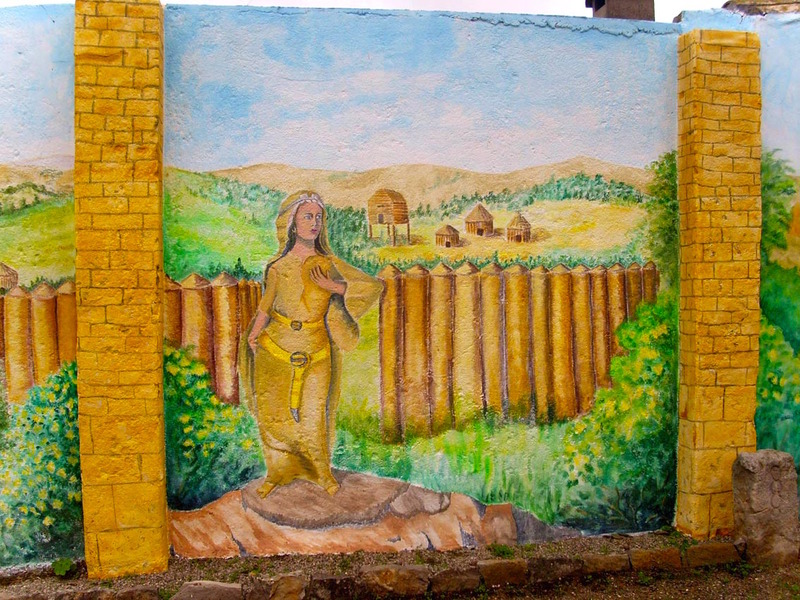 Just look at that wall construction - pure Visigoth! 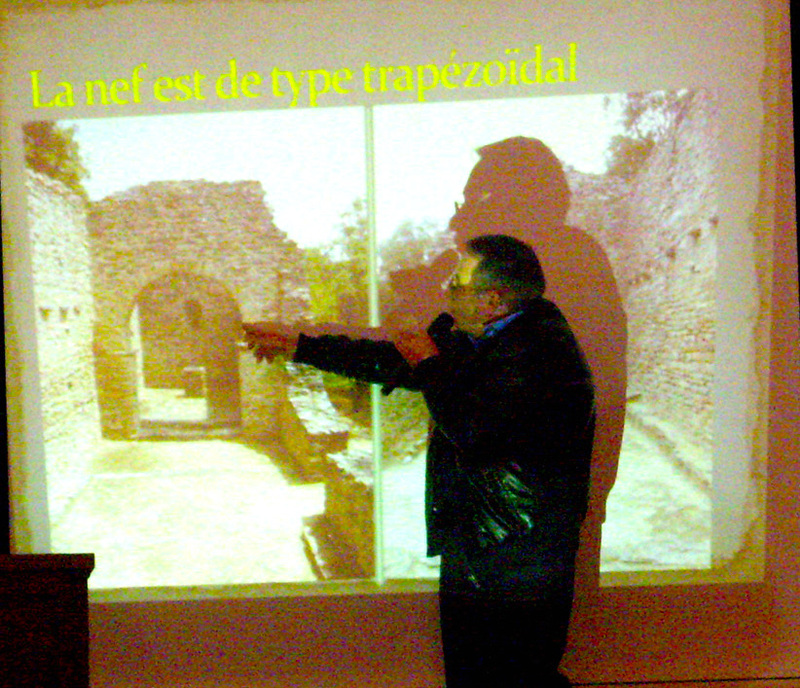 I was delighted to go to a lecture given by SESA the following spring. 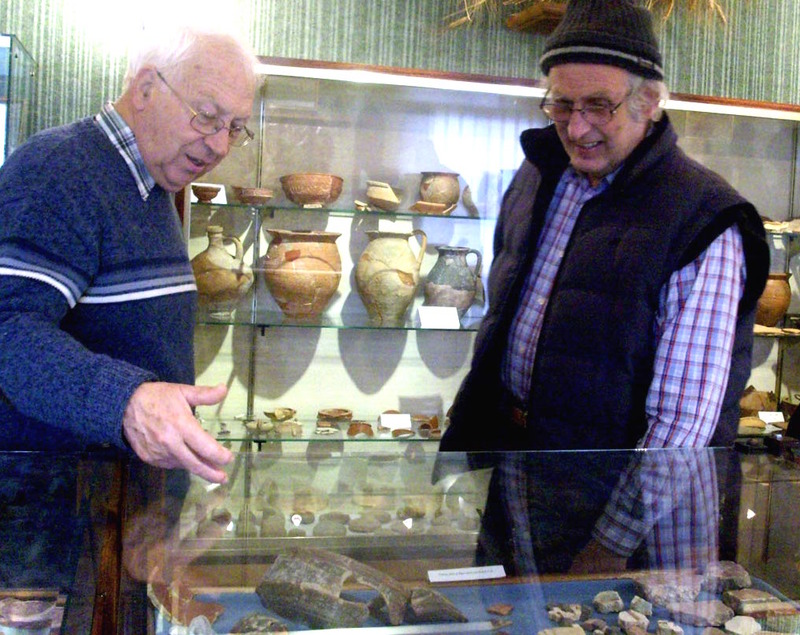 An early photo of the intrepid archeologists working at the chapel. 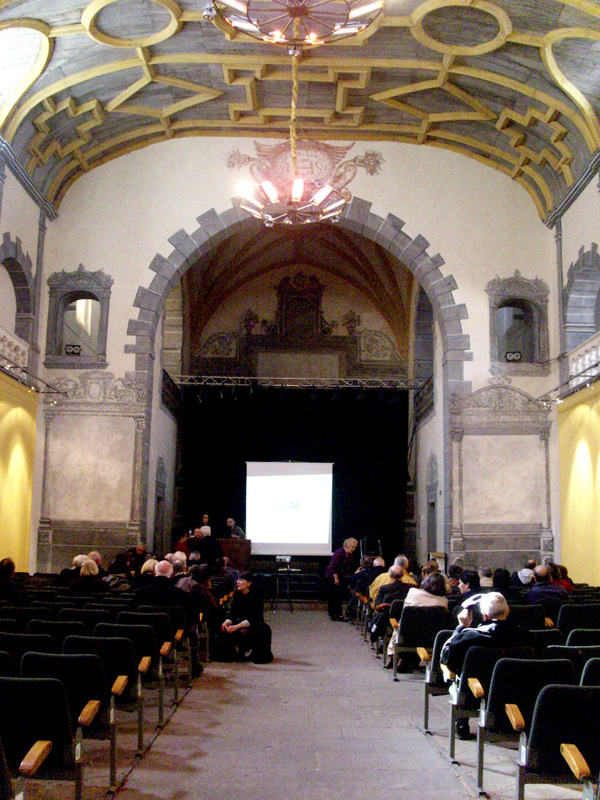 SESA's meetings are held in the Jesuit chapel in Carcassonne. 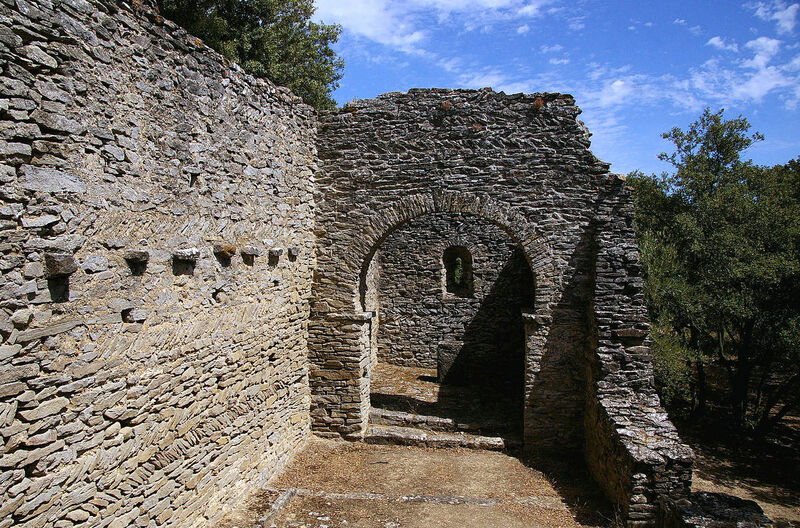 The arch is typically Visigothic, but the trapezoidal-shaped nave is rarely found. 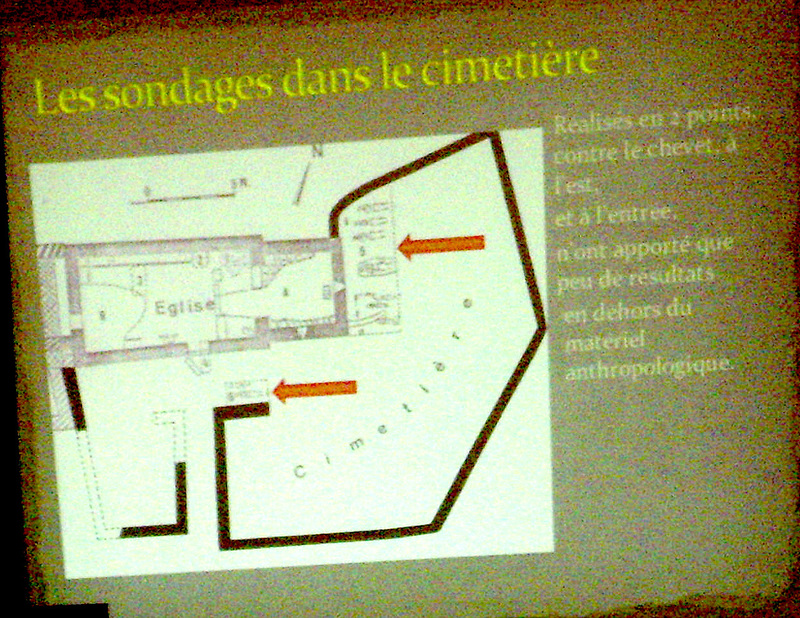 Our lecturer explained this map. To enter the chapel, you must cross four rooms; and below the second is a little underground river. It's thought they did whole body baptisms here in this river. Neat eh? 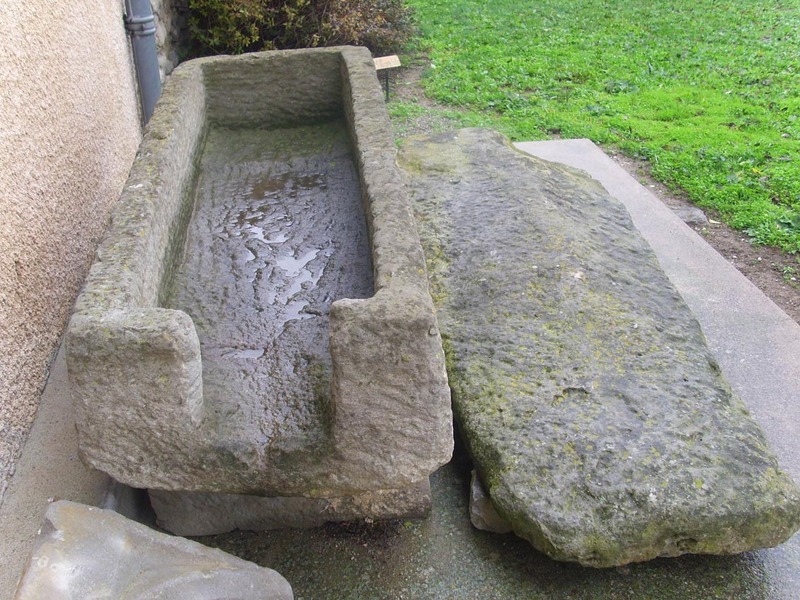 In early Christianity this was an important initiation ceremony for adults; as it was for Jesus himself when he was baptised in the River Jordan by John the Baptist. The chapel dates from the third century and remained in use until the 19th century. It is possibly the first Christian church in our region and pre-Roman Catholic - the Visigoths were Arians after the Alexandrian priest, Arius. 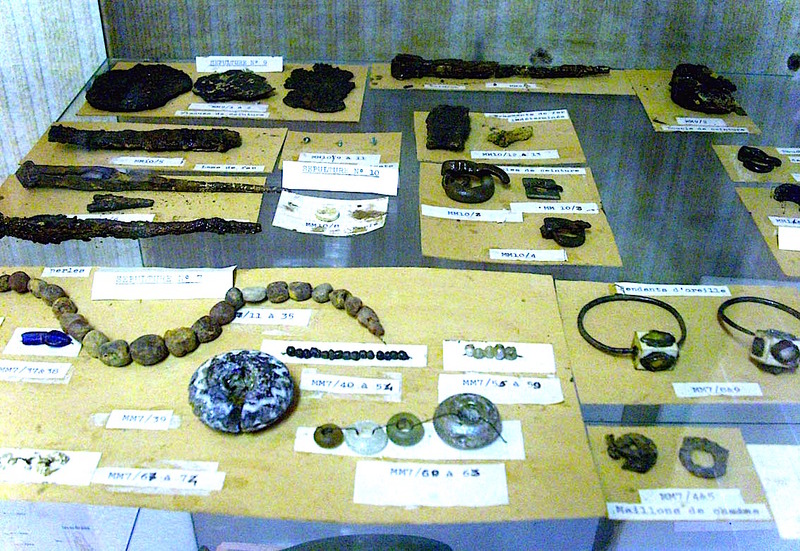 We also saw slides of graves and their contents; personal possessions were often buried with people. So - one could spend the entire day at Villarzels-Cabardès and I will be doing that again as soon as possible!